Product information "Waiter's holster with chain ALPHA brown leather"
The waiter’s holster ALPHA made of grassland leather is a valuable and optically attractive accessory for gastronomy workers that convinces by its versatility. Are you working in the gastronomy? Then you surely know how important a nice, spacious and practical waiter’s bag is! With the waiter’s holster you will be always excellently equipped: it captivates with its classic, sturdy appearance that can be combined with practically all working outfits. Even on the most stressful days, this holster will fulfill its function perfectly. It provides enough space for a waiter’s wallet, some pens and a notepad and keeps everything well-arranged thanks to the smart inner organization of the pockets. It is all about the inner features! The grassland leather waiter’s holster convinces with its qualitative and high grade processing and the also first class materials that have been used for its manufacturing. We all know that gastronomy is a work branch that can get very stressful, therefore we have designed a specially sturdy accessory that can withstand even the busiest days or nights at work. 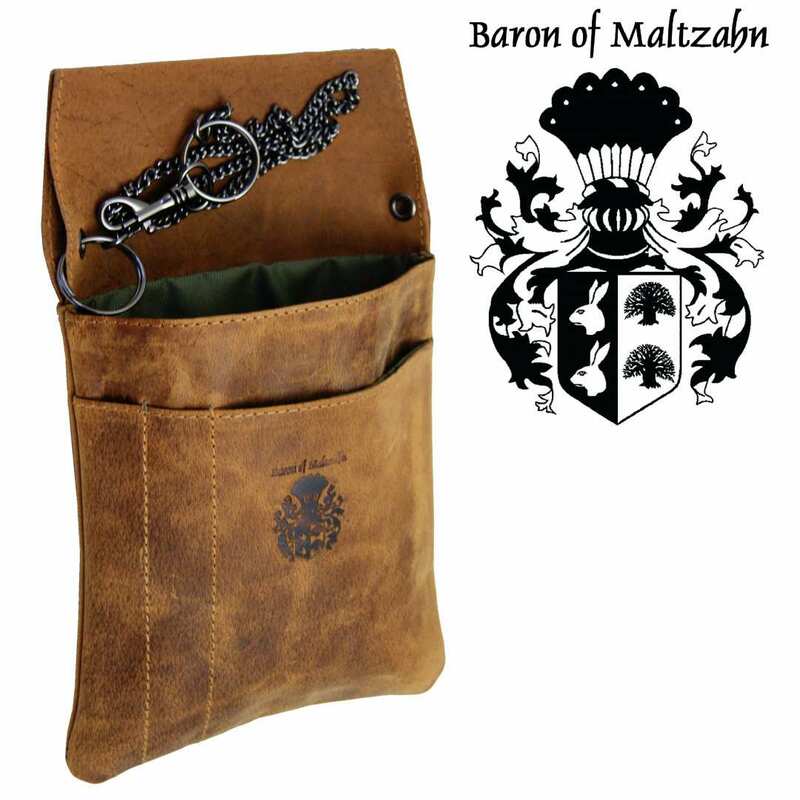 We are speaking of a piece of the Collection BARON of MALTZAHN, thereby this object is rounded up with some indispensable details, like the exclusive gun metal fittings, that give character to the leather accessory. The total size of this waiter’s holster is 8.7 x 5.5 in (22x14 cm). The material used for the manufacturing of this waiter’s holster is grassland leather. This kind of cowhide captivates by its valuable look and by the robust characteristics. These make the holster long lasting, so that you do not need to worry about purchasing another holster for a very long time. Delivery fulfilled in just a few days! 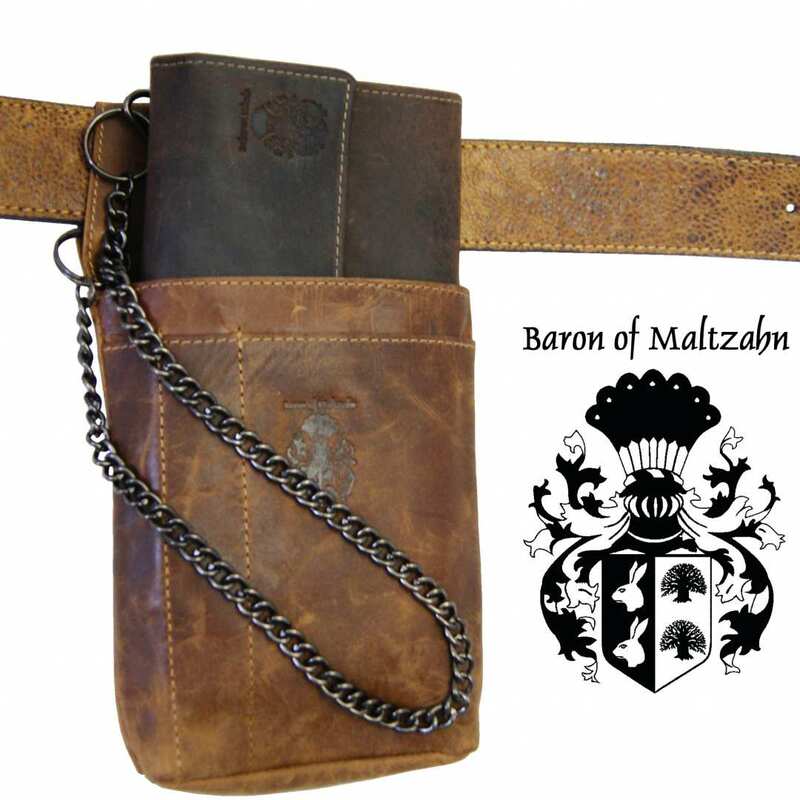 Order now your waiter’s holster made of grassland leather and receive it comfortably at home some days later! Let yourself be amazed by the quality of this leather accessory and enjoy the article a very long time. Do not miss this opportunity – order now! Reviews for "Waiter's holster with chain ALPHA brown leather"